Kubi: Please tell us about yourself? Dr. Baliga: I grew up in a small village called Jalahalli near Bangalore, India. I obtained my Bachelors degree from IIT-Madras. After that, I was ambitious and wanted to do something that serves humanity. I came to the US in 1969 to do research to fulfill this mission. During those days, IIT was almost unknown. I applied to MIT, Sanford and other universities but did not get financial aid. Luckily, there was an opening at RPI and it was my only financial offer. I completed my PhD at RPI in 1974. During my research at RPI, I developed a new process to grow semiconductor material involved mixing a very poisonous gas with an explosive material. I could have killed everyone in the building. It took me about a year and half to find conditions to safely grow that compound and complete my research work. Today, all microwave transistors and LEDs are manufactured by using this process. After my PhD, I applied to many companies to continue this line of research with no success. It was in the middle of 1975 recession. Fortunately, GE was creating a new group to research power devices and I was hired. This was a mature field but, within five years, my work revolutionized the industry. 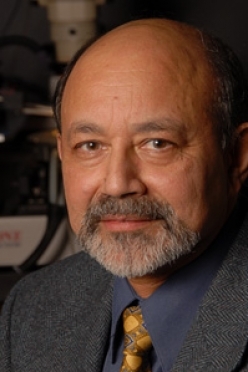 Dr. Baliga: The story of the insulated gate bipolar transistor (IGBT) is very interesting. It is a power semiconductor device known for high efficiency and fast switching. One day, a manager from the A/C division at GE came to the lab and challenged us to create a device that is compact and highly efficient for controlling electrical power. Within a month, I came up with the IGBT which was compact, highly efficient and fast switching. In general, it is not difficult to come up with an invention, but it is very difficult to come up with something that can be used easily manufactured at low cost. I also created a process for the IGBT so that it could be built using existing production lines, which is very rare for a new invention. As a result, I took the IGBT from invention to production in six months. GE started using it in appliances, air-conditioning, lamps, then in locomotives, medical devices and many other applications. The invention had a huge impact on GE. So one day, I got a call to describe my invention to the chairman of GE , Jack Welch. Fortunately, he was favorably impressed leading to my elevation as Coolidge Fellow at GE. The IGBT is now produced by a dozen companies around the world and is used in regular cars for running the ignition system, electric cars for running electric motors and even in bullet trains. It is used in compact fluorescent lamps to save about 75% of energy. It is used in UPS systems and to control robots in factories. Recently, the IGBT has been used to create portable defibrillators which can save 100,000 lives per year. Kubi: How do you feel that common people like me are not aware of your wonderful inventions? Dr.Baliga: I feel fortunate that I have contributed to the society as planned before coming to the US. So it doesn’t matter that everyone should know about it. The department of energy did a study on how much energy is being saved because of the IGBT. They estimated that it saves about 70 Giga watts of power. Cost of a power plant to generate 1 Giga watt is about 2 Billion dollars. Just by not building those power plants we are saving about 140 Billion dollars. On top of that when coal-fired power plants are built, which is true for most of the power plant that are being built, they emit huge amounts of carbon dioxide. About One Trillion pounds of carbon emission is eliminated due to power savings from IGBT. That is more important than cost savings. It is very exciting. An average consumer uses energy which generates about 8,000 pounds of carbon dioxide a year. My work is offsetting emissions produced by 125 million people. Everybody is sensitive about carbon footprints. If you conserve energy, we will have a huge impact in reducing pollution. Some people preach not to use air-conditioners and clothes dryers. I say that you can continue to use them because I have made them more efficient. I call it engineering a sustainable society. So, my dream of contributing to society has come true. Kubi: When did you move to Raleigh? Dr. Baliga: I came to Raleigh in 1988. I left GE after working there for 15 years. Mr. Welch did not want to remain in the semiconductor business because the financial return was not enough. GE assured me that they will move me up in management as I was also good at managing people. Second option was to work for another company in electrical sciences. Third option was to go to a University for research. No university was doing the semiconductor research that I was involved in because they were focusing on computer hardware related research. I came to NC State because the state of North Carolina had a very nice fabrication facility called MCNC. During my interview I made it clear that I wanted to use this facility for my work. After coming to NCSU, I raised the funds for students to work at MCNC resulting in an excellent partnership. This facility was the main reason I came to Raleigh. The second one was to work on my inventions about wide band gap semiconductors. I had concerns that the performance of power devices was limited by the properties of silicon. How to overcome these limitations? I was the first one to ask this question. The question is easy to ask. But, then I had to figure out the solution. I came up with an equation that predicts how much performance enhancement one can get by changing the properties of the material. This equation is now commonly called Baliga's Figure of Merit. It is one of the 3 equations used extensively in semiconductor industry. When any new material is discovered, the performance can be predicted using that equation. I derived it in 1980. Using my equation, I worked out the number for silicon carbide and found that it was 200 times better than silicon. At NCSU, I then went on to build the first high voltage silicon carbide devices in 1991 with my students. In 2000, several companies launched silicon carbide products that are available in the market place. This is considered to be another revolution in power devices. It will improve the efficiency more than is possible with my silicon IGBT invention and it will replace the IGBT in some applications in the future. Kubi: You are the founder of Silicon Semiconductor Company. Please tell us about it. Dr. Baliga: I came to NC state with 60 patents all owned by GE including those for the IGBT. When I came here, I continued to innovate and it was natural that I wanted to file for more patents. In 1988, I found that university had no system for filing patents and no money was devoted for prosecuting the patents. When I founded the Power Semiconductor Research Center (PSRC) in 1991 and got funds from all over the world, I also created an agreement for filing the patents with the support of all the companies which were supporting my research. With this support, I was able to obtain approximately 50 US patents at the university. For any inventor, 50 patents is quite large but for a university professor it is extremely unusual. My mission was to have an impact on society with these inventions since there is no point in having the invention as a piece of paper. Initially, I assumed that the PSRC sponsors would adopt this technology and manufacture it. But they were not doing it; they had their own internal innovations that took priority. In 2000, the university decided to invite Venture Capitalists to invest in companies for taking university technology into the market with good ROI. The VCs came to me and asked whether I wanted to start a company as I had the most number of patents at NCSU. I took an idea that I invented for RF cell phone applications and thought of taking it to the market. That’s how I started a company called Silicon Semiconductor Corporation (SSC). At the end of 2000, I was able to get a big investment from one of my sponsors Fairchild Semiconductor Corp. They decided to put 10 million dollar on the table, to take this company to the next level. For me, an equally important part was that they said that I can have access to their manufacturing line with 10 people working for me. So, I signed up with them and within a year I produced the microwave device for cellular base-station applications. The device was tested by all the big cell-phone network manufactures, such as Lucent, NOKIA, etc. They said it is exactly what’s needed for the 3G network. So it really worked well and I hired 40 people at SSC. My involvement at SSC was so intensive that I had to take leave from the university in 2001. I then devoted myself to this company for 2 years. However, the telecom market collapsed in 2003. All the telecom companies said we do need your technology but we are not investing in 3G for a few years. To save my company from bankruptcy, I had to quickly invent another chip that was targeted to powering microprocessors in computers. My technology improved the efficiency for delivering power to microprocessors. We got our product out in 6 months. The technology was bench marked by Intel to be approximately 3 years ahead of other companies, such as Phillips, Hitachi, Mitsubishi, and International Rectifier. For a little company to be ahead of these big companies was a major accomplishment and my inventions are now in the market. With this experience, I discovered that it is interesting and challenging to be a Entrepreneur. Kubi: Scientific American Magazine has named you as one of the Eight Heroes of Semiconductor Revolution. How do you feel about this? Dr.Baliga: I felt very surprised. I didn't expect it. There are so many thousands and thousands of people who have made contributions in semiconductors. Getting this recognition as one of the Eight Heroes is something special. Scientific American Magazine celebrated the 50th anniversary for the invention of the transistor with a special commemorative issue. Transistors were originally invented at Bell Labs by William Shockley, John Bardeen and Walter Brattain,who got the Noble Prize in 1956. The integrated circuit was invented by Robert Noyce at Fairchild and by Jack Kilby, who got a Noble Prize in 2000, at Texas instruments. Intel was founded by Gordon Moore. On the 50th anniversary, Scientific American Magazine came out with a special edition. I got a phone call from the editor saying he heard about a super-transistor called the IGBT and wanted me to contribute an article on the device. When the magazine was published, I read the editorial page and was delightfully surprised to find out that they had named me as one of the eight heroes among the people that I just named, who were my inspiration when I joined the field. Kubi: You have authored 12 books and co-authored 550 publications, what inspired you to write? Dr. Baliga: It’s a natural thing for a Scientist. When I wrote the first paper which was at RPI, lot of people said nice things about it. It was a satisfying feeling and I started enjoying writing articles. I wrote quite a few papers while at RPI and then even at GE. Publishing papers was not our main goal at GE and I had to hold back on writing about the IGBT until it became fully commercialized. Now that I am at the university, our main goal is to publish papers. So, my output has accelerated until I started my company in 2000. The underlying reason why we publish papers in academia is to get recognition as scientists and to share our ideas with everyone so that people can innovate on them. Recently, I have been writing many books, 4 books in the last 5 years, for educating students and young research scientists in the industry. Kubi: Which award gave you the most happiness and made you feel proud? Dr. Baliga: Well, I never did any work just to get an award. But, my happiest moment was, when I was recognized as one of the eight heroes of Semiconductor Revolution by the Scientific American Magazine. The other one that is equally special to me was when the National Academy of Engineering elected me as a Member at the age of 45, when the average age for members was 77 years. Kubi: What is the secret of your success? Dr. Baliga: I don’t believe that I am the smartest person even though I was selected among the Brightest Young Scientists in America by Science Digest magazine. I believe that nothing substantial can be achieved without hard work and I firmly believe there is no such thing called Luck. One needs to create opportunities and work hard towards achieving results. As Edison said “It is 1% inspiration and 99% perspiration”. I took on a challenge at an early age towards improving the quality of life for people and have fortunately been successful in achieving this objective. Kubi: As a founder of SSC and world renowned semiconductor expert what advice would you like to give to the people? Dr. Baliga: Be passionate about what you do. Have a mission that excites you. In my case, service to humanity was my mission. And remember to work hard towards your goal. Kubi's Comments: Dr. Baliga has achieved a great fame. However, is very humble and modest. He is relentless in pursuing his passion. His contributions have revolutionized many things that we use in every day life. His story has inspired me to work on my passion. 2001 - ISI "100 Most Highly Cited Scientists in Engineering"
1984 - IR 100 Award for "Gallium Arsenide Schottky Power Rectifier"
1983 - IR 100 Award for "Insulated Gate Transistor"
Click here to read about other Inspirational Triangle Indians.